When Brett and Myla Stevens came into the shop asking how to improve the shifting on their already awesome Salsa Cycles Powderkeg tandem, our Service Manager/Bike Wizard Austin Turner's immediate response was simply "Di2". After the initial laughter subsided and he began to map out a plan to make this pipe dream a reality, they agreed to let us embark on a warranty-voiding adventure. Austin is the mastermind behind a large number of mad-science undertakings, so this project landed in his lap and he completely crushed it! 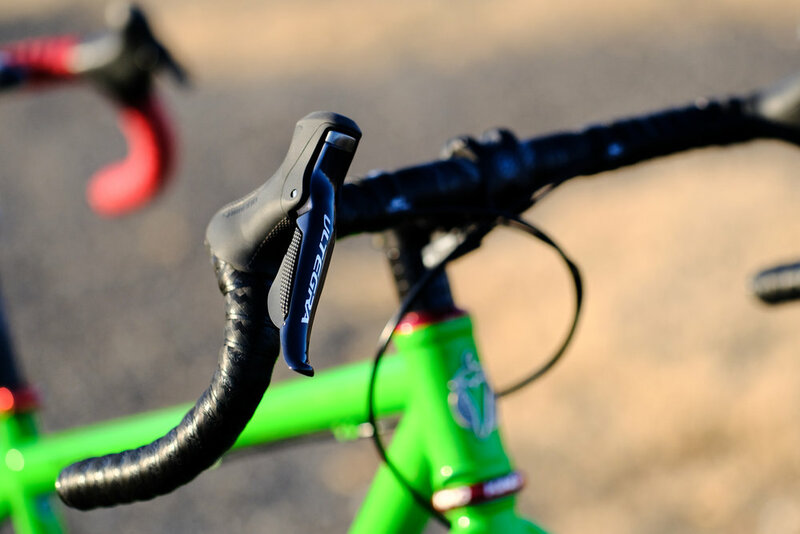 Starting with Shimano Ultegra Di2 shifters, and the choice to keep the existing (and strong) TRP HY/RD brakes, the next steps involved figuring out how to make the necessary gear ranges possible. 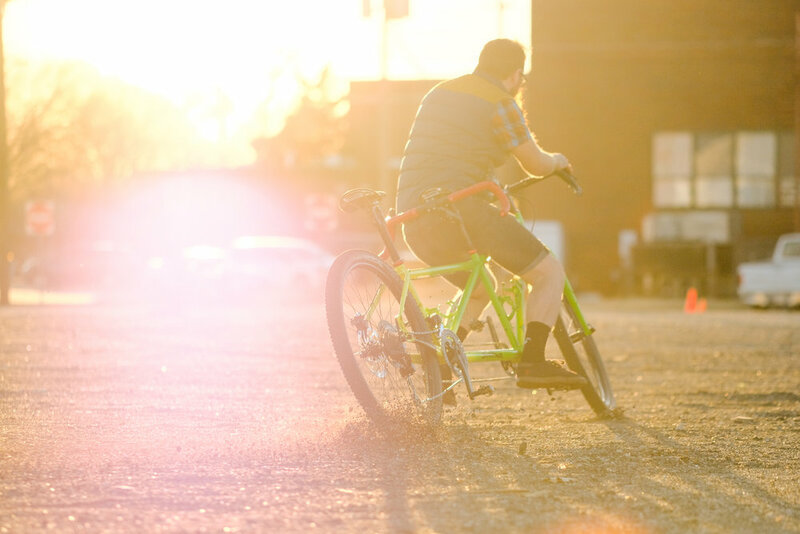 With any tandem, and especially one used primarily for ultra-endurance gravel events like Dirty Kanza, Gravel Worlds and our own Land Run 100 having a huge range of gears available is a non-negotiable necessity. Using a mountain ultracompact crankset, the front shifting is handled by Shimano's excellent XT Di2 front derailleur. The cassette is a Shimano 11-speed XT, with a MONSTER 11-46 tooth range. To accommodate this extreme range, especially with a double crank, Austin modified the rear XT di2 derailleur with a long cage, an option not offered by Shimano at any level. This setup shifts incredibly well even under load, and offers an unbelievable amount of gear range as well. This was a super fun custom setup, and we are absolutely stoked to see "Team Bryla" dominate some gravel on "Jean Claude Tandamme"! Enjoy the photos, give us a call to get your rad custom build started!